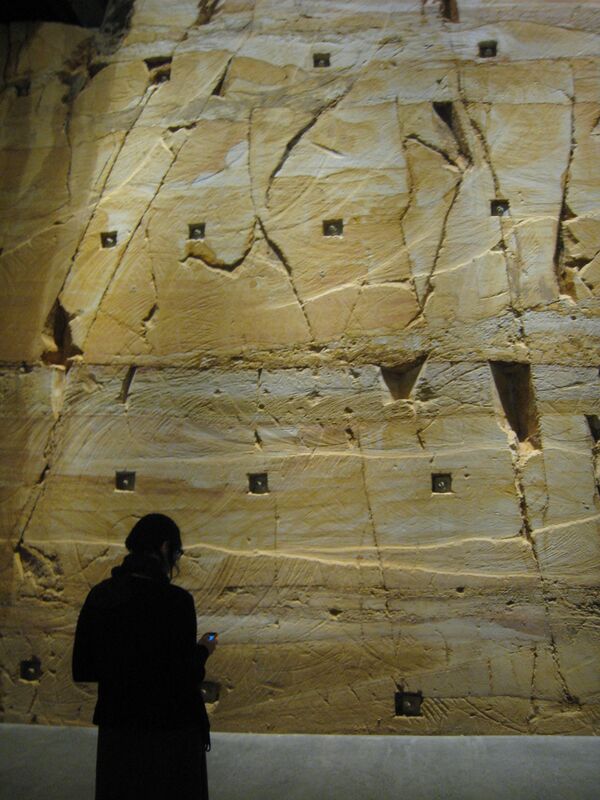 The excavated sandstone wall is part of the MONA experience. Photo: T. Clement. I finally made it down to Hobart to visit the Museum of Old and New Art (MONA). Even though it only opened in January, to hear people talk, it seems just about everyone in Sydney has already made the trek south: this private museum appears to be single-handedly re-invigorating Hobart as a tourist destination. And you can see why. MONA is a winning combination of vision and unlimited funds. And critical to its success, MONA is the vision of just one person. This is not a museum initiated by a committee, subject to the diluting process of consensus decision making. Each acquisition did not have to meet any criteria other than the fact that David Walsh, the man behind MONA, wanted it. Now, no doubt Walsh has had lots of help and, as a man with millions, has been able to pay for the very best advice, but when it comes down to it, MONA is the physical manifestation of the passion of just one person. As such it’s a shining example of the amazing things that can be achieved under the reign of a benign dictator. If only dictators tended towards benevolence instead of avarice. Of course I have no idea what Walsh is like to work for. He may be as corrupted by power as the next potentate. But there is no doubting his generosity to the public. It is highly unlikely that the man labelled by the press as a reclusive and eccentric professional gambler is making any money out of MONA. For a start, entry is free. And, while I certainly don’t have a degree in business or accountancy, it seems improbable that any income generated by the hotel, café or gift shop would even come close to covering running costs. Never mind the millions spent on construction and works of art. When I returned to Sydney, everyone asked me what my favourite artworks were. But strangely, while naturally there were some I responded to more than others, I didn’t really think of my visit in terms of individual pieces. MONA is a complete package of an experience. It’s the art, but it is also the architecture, the ferry ride, the cold wind, the nifty interactive i-pod tour thingo, the moody lighting and, last but not least, the intoxicating whiff of wealth. The sum is definitely greater than its parts. Not only is it a package, MONA is a gift. And not just because it is a nice, affordable day out. As the vision of one man, it is the rare opportunity to walk through the inner recesses of another person’s psyche. I agree – MONA does indeed feel like the complete museum experience. The abilty to immerse yourself in the art alone (and of course supported by an incredible building) is its trump card. I felt like I’d scored a golden ticket to see inside but really the best thing about Mona is that David Walsh has made it possible for everyone to sample. And FREE… while it lasts. I heard a rumour visitors from out of state were going to be made to pay soon. Wonder if it is true? ?